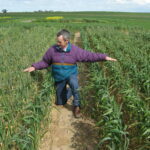 You are here: Australian Herbicide Resistance Initiative › News › What matters more? 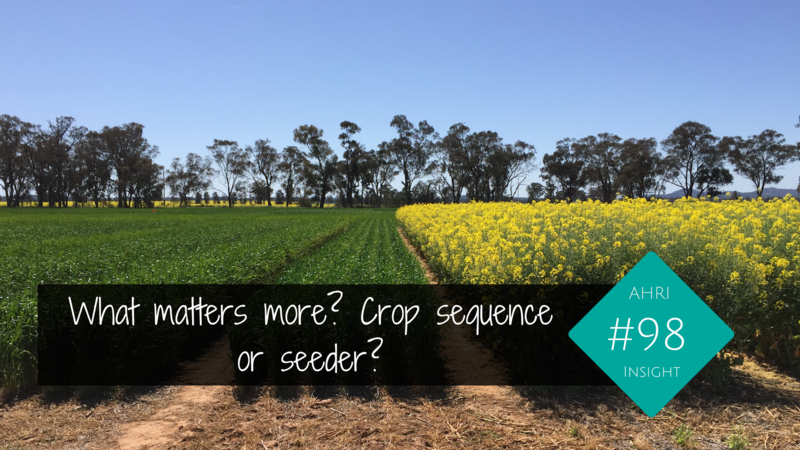 Crop sequence or seeder? Can we get away with a single break crop if we throw enough ‘aggressive agronomy’ at a ryegrass population? 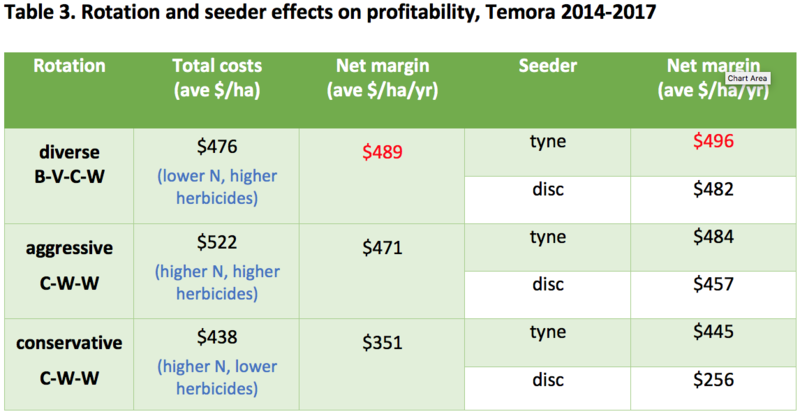 Are expensive herbicides worth the money? What is better, disc or tyne? Why were the batsmen tampering with the ball, shouldn’t that be the bowler’s job? These are all questions that were being asked by a local project committee of growers and advisers, and there was only one way to answer them. Enter Tony Swan from CSIRO. He and his team embarked on a massive, long-term research effort in Temora NSW, working with FarmLink Research to make it happen. The trial ran from 2014 to 2017 and the preliminary results are in. Diverse crop rotations, including a double break, premium herbicides, with some extra crop competition courtesy of barley thrown in, and we have a winner. 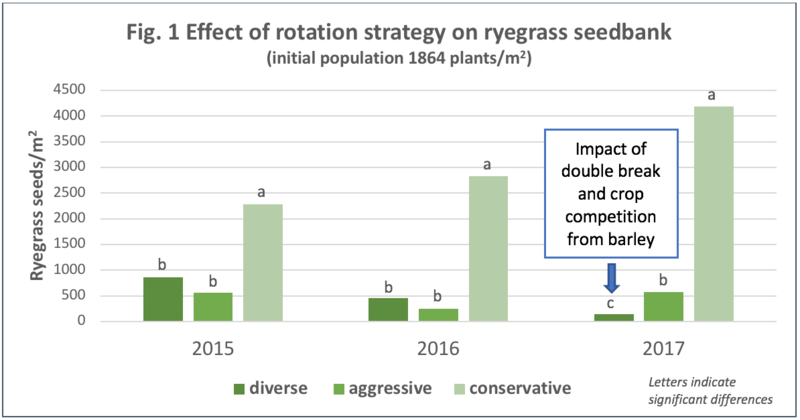 This diverse crop rotation smashed ryegrass numbers down from 1864 plants/m2 to 145 plants/m2 in just three years, and it was also the most profitable rotation. More crop, fewer weeds, more profit. While four of the ‘Weedsmart Big 6’ tools were used to achieve this, Tony reckons ryegrass numbers would have been obliterated if they could have used the other two strategies – crop topping and harvest weed seed control – in their trial plots. At the other end of the scale, the conservative rotation with a single break crop, low-cost herbicides and low crop competition saw a blowout in ryegrass numbers and reduced profit. Undaunted by the ‘disc or tyne’ challenge posed by the committee, Tony and his team sowed each rotation with both seeding systems each year. A fantastic achievement, but essentially there wasn’t much in it – suggesting that there are bigger fish to fry when it comes to weed management. In a previous AHRI Insight, we highlighted research by Tony Swan and the team from CSIRO that showed double breaks (i.e. growing two break crops in sequence) were more effective in reducing annual ryegrass numbers than a single break crop or continuous wheat. The research team took this one step further in a project involving FarmLink in southern NSW from 2014-2017, comparing three rotation strategies between disc and tyne seeding systems in a stubble retained system and their impact on ryegrass, yield and profitability. 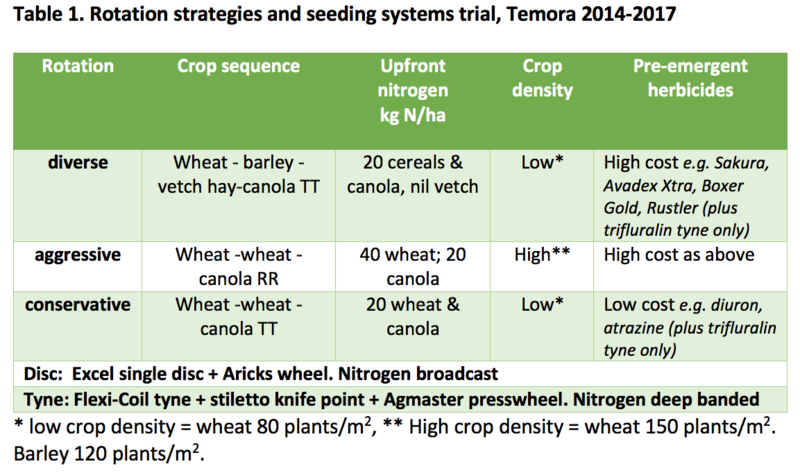 The table below summarises the farming systems that were compared in this gruelling four-year trial. Mixing and rotating high cost, premium herbicides. This combination reduced the ryegrass seedbank by 70%, compared with a single break aggressive rotation of wheat-wheat-canola. Where low-cost herbicides were used in the conservative rotation, things got a bit ugly, with ryegrass numbers in the wheat-wheat-canola rotation blowing out by 600% (Figure 1). 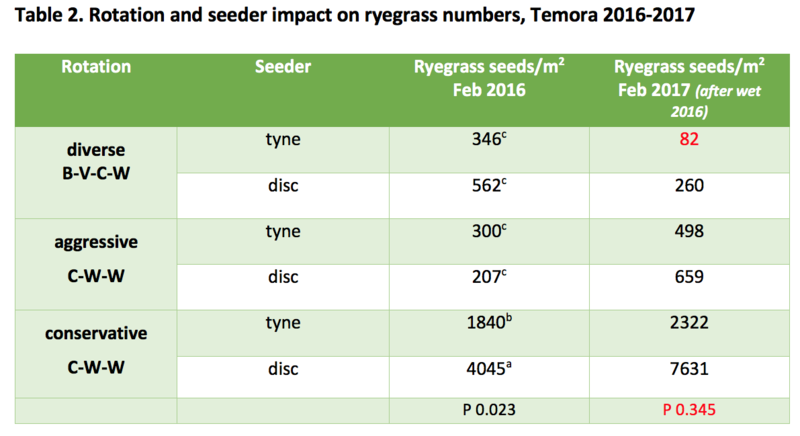 There wasn’t much difference in ryegrass numbers between the disc and tyne systems where premium pre-emergent herbicides were used in the ‘diverse’ and ‘aggressive’ rotations (Table 2). The tyne system had the edge over the disc following the very wet 2016 season, but keep in mind that the disc system didn’t have the benefit of trifluralin application (Figure 2). Ryegrass numbers did blow out for the disc system where low-cost herbicides were used in the ‘conservative’ rotation. This comes as no surprise as herbicide options were limited for the disc seeder in this treatment and don’t reflect recommended agronomy for high ryegrass populations. Profitability over four years was highest for the ‘diverse’ rotation. This was primarily driven by lower nitrogen costs, but also due to higher yields from barley compared with a second wheat crop in the other rotations. As noted by the project team, the diverse rotation also allowed crops to be sown into less antagonistic stubbles for improved emergence and disease management in a stubble retained system (e.g. avoiding canola sown into cereal stubble or wheat sown on wheat stubble). There were no yield differences over four years between disc and tyne systems where weeds were managed in the ‘diverse’ and ‘aggressive’ rotations. 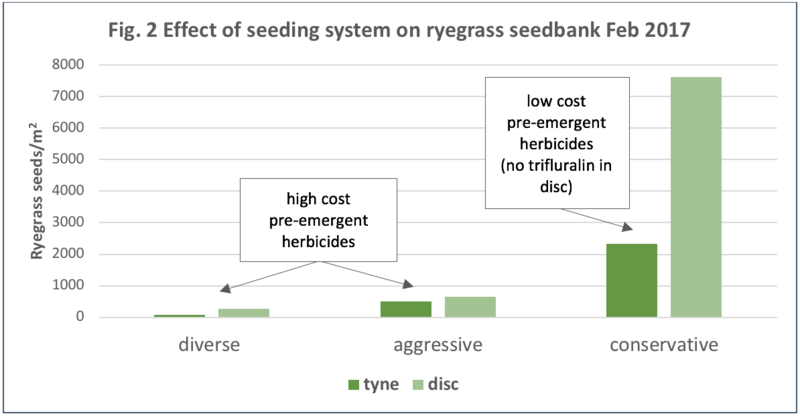 In the ‘conservative’ rotation with low-cost pre-emergent herbicides, yields were higher in the tyne system where ryegrass numbers could be managed with the addition of trifluralin. It never pays to tamper with the cricket ball! Read A flexible approach to managing stubble profitably in the Riverina and Southwest Slopes of NSW by Tony Swan. This research was funded by GRDC.